1950 APV acquired a new factory in Crawley to which it would transfer its work from two sites in Wandsworth and one in Shepherd's Bush. 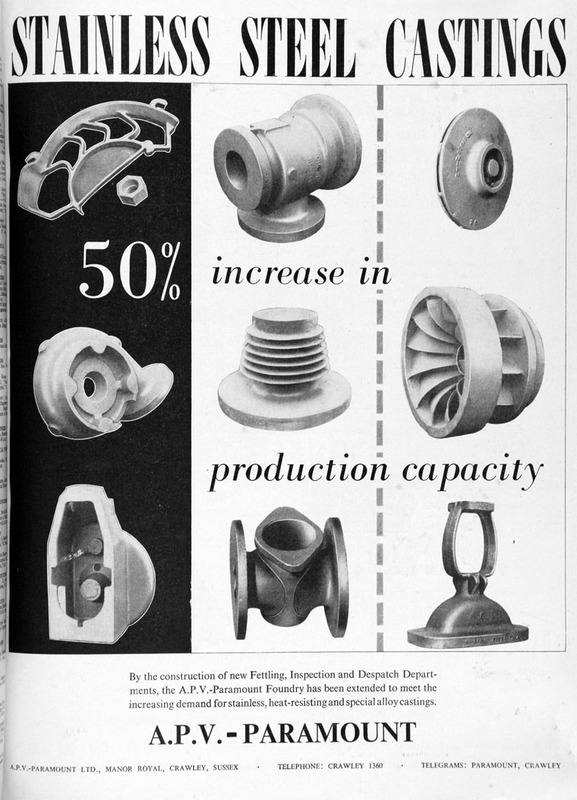 1957 Maker of stainless steel and heat resisting steel castings. Mr Meade had concluded that, although the Billingham tube-spinning foundry could be operated successfully, the Paramount foundry at Braintree would continue to lose money. He, therefore, decided to transfer the production of certain tube fittings from Paramount to Billingham, retain the machine shop at Paramount and to dispose of the rest of the foundry business. c.1988 Merged certain assets transferred from the former Paramount foundry at Crawley with Lake and Elliot at Braintree which Mr Meade also owned. 1989 The Paramount foundry at Braintree was acquired by William Cook; the site was retained for redevelopment. This page was last edited on 10 February 2019, at 12:35.